My invite request to Facebook Graph Search was accepted this week. It came with no fanfare at all… I just noticed a different looking search bar and that was it. So far most of the interesting searches I’ve tried brought me to a Facebook web browser powered by Bing… Boring. 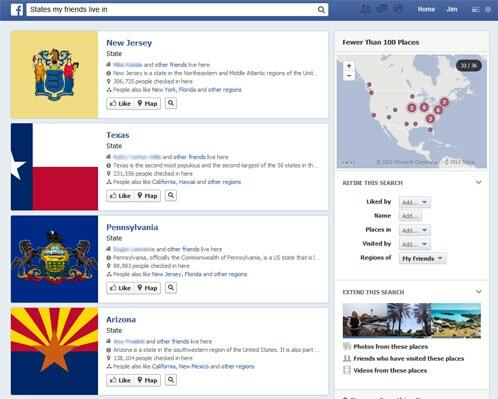 My favorite successful search so far has been “States my friends live in.” It pulls up a nice map of the US, the state flags and you can drill down to find out more about each location. Pretty cool. You can also find friends that have checked in at certain locations. This was available before by visiting the pages themselves, so it’s not that big of an improvement. One of my biggest complaints about Facebook for the last few years is that they want you to ram your info down the throats of all your friends. Either via the timeline or the smaller news ticker. You can’t add info to your account without publishing it first. You can always take it down afterward, but that’s an extra step that’s annoying. I hope that Graph Search will make Zuckerberg re-think this strategy. It will be crucial to build up more data from which to pull for Graph Search. So for instance, I may not want to check in at Hammonasset Beach State Park today because I’m supposed to be working and I’m friends with some of my clients on Facebook. Or I’m traveling to Aruba for a few weeks and I don’t want everyone to know my house is wide open for robbing. However, I would like to add both to the places I’ve been, so that Facebook becomes an online scrapbook of my travels. I don’t mind if people know I’ve been there, I just don’t want them to know I was there today. Adding a “check-in to scrapbook” option will help to populate Graph Search with more people visiting more places and make the searches more interesting. I also wonder how long it will take before Facebook drops the unnecessary “Graph” from the name and it just becomes Facebook Search?